In addition to providing off-the shelf market research reports, we also engage with our clients on bespoke consulting and research requests. Our experience tells us that it is the interpretation and insights, based on market data, which is really helpful for our clients. Over the last many years, our in-house experts have provided extensive support on commercial, strategic and marketing issues in the pharmaceutical industry. Prioritise mid to long term focus areas. Drive strategic decision making, including product development and launch. Identify potential geographies and market segments to improve and sustain overall profitability. Most of these projects are handled by a team of analysts, led by an in-house expert. Our unique approach allows us to blend the skills our consultants have developed in top-tier consulting organisations with the mindset of a smaller boutique consulting firm. For each customised project, we give our clients open access to all the research and analysis which is conducted on their behalf. Pipeline Tracking: We help clients in developing a comprehensive perspective of drug / therapy development programs, providing information on contemporary competitive landscape and important focus areas within the market of interest. 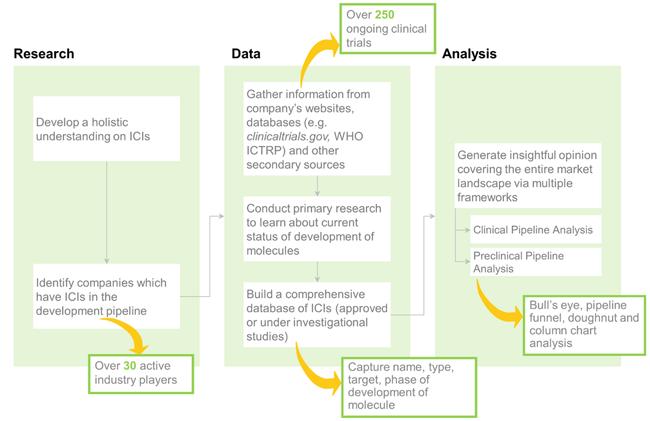 In addition to providing an in-depth analysis of clinical and pre-clinical / discovery stage programs (based on class / type of molecule, developmental phase and other relevant parameters), we use a variety of robust frameworks (such as Bull’s Eye, and Pipeline Funnel Analysis) to distil relevant information in order to generate an accurate assessment of the market landscape and establish immediate and long-term research objectives based on our clients’ business related goals. We also help identify the closest competitors of our clients, offering a customized and informed ‘threat’ map that highlights the strengths and weaknesses of competing stakeholders within an industry / sector. Therapy Area Assessment: We help clients build a detailed understanding of their respective areas of interest. Our highly comprehensive therapy area assessment reports provide deep commercial, technical, regulatory and other relevant insights to assess the competitive landscape, epidemiology, development pipeline, unmet needs / existing gaps, and overall opportunity within an industry / sector. We identify key market dynamics that are likely to shape the future of a market specific to the domain; this includes identifying companies engaged in the field, along with the list of products / product candidates being developed by the aforementioned companies for the treatment / diagnosis of the associated disorders. We also elaborate on clinical trial designs of late stage molecules and help align clients’ development strategies. Clinical Trial Tracking: We track the latest developments in clinical trials, pertaining to a specific therapy area / clinical condition. We regularly assist our clients in benchmarking clinical trial designs and study results, offering detailed insights on various parameters, such as phase of development, biological targets, disease indications, underlying technologies, patient enrolment data, patient eligibility and inclusion / exclusion criteria, study design and objectives, treatment arms, routes of administration, treatment endpoints, trial locations and a number of other relevant details. We also provide customized and well-informed recommendations on clinical trial evaluation parameters for clients’ proprietary product candidates based on data collated from ongoing / completed studies, and analyzed based on a variety of proprietary evaluation methods. KOL Selection: We identify relevant KOLs across multiple therapy areas / fields of expertise and maintain a high-quality network of thought leaders from across the globe. The approach requires us to not only leverage our existing network of partners, but also continuously expand our global reach. We ascertain relative strengths and weaknesses of KOLs based on parameters, such as contribution to scientific literature, patent portfolio, experience in clinical trials, affiliations with companies / patient organizations, and participation in relevant activities in the community. We also screen and identify high priority subject matter experts (using a proprietary algorithm), who are most suited for a particular role, and establish connections between different stakeholders in an industry / sector. Publication Analysis: We understand our clients’ need to stay updated and informed regarding the latest developments and scientific research within an industry / sector. We can offer a range of relevant insights, customized to meet our clients’ requirements, by analyzing data available in peer-reviewed, scientific research, or business-related publications. Our expertise includes preparing abstracts, characterizing important / relevant study designs, discerning the focus of publications, identifying popular molecules and offering a range of other insightful details mined from publications related to a therapy area / disease indication. In addition to abstract writing and author profiling, our publication analysis team is adept in developing a thorough understanding of relevant scientific literature, highlighting key trends, popular focus areas and offering deeper insights into research mechanics and other technicalities. 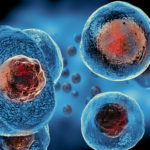 Our research and proprietary analytical methodologies also enable us to make key strategic suggestions to our clients, advising them on how to comply to existing benchmarks and achieve best-in-class outputs, across different types of preclinical / clinical studies of their proprietary drug / therapy candidates. Investment Analysis: We offer robust data acquisition and analysis support related to funding and investments made in the past, offering insights on the type of investment (seed financing, venture capital investments, public offerings and other equity investments, grants, debt financing etc. ), the amount invested, and information on active investors, to help develop an accurate perspective on the overall investment climate in an industry / sector. We understand and elucidate existing trends in a market in order to help facilitate clients’ ‘Go / No-Go’ decisions regarding investments, backing our insights and opinions using informed business cases. We also analyze and recommend potential investors whose investment agendas are better aligned to our clients’ portfolios, and who are more likely to respond to a call for fresh investments. Market Assessment: We provide an accurate and comprehensive assessment of the market, highlighting the competitive landscape, key trends, pricing data, current market size, future outlook, key challenges and opportunity areas for different stakeholders, and emerging pockets of growth. Our market assessments are based on informed assumptions related to the likely factors that have the potential to drive industry growth, factoring in contributions from specific product types. Specific to a particular product, we also benchmark product competitiveness, vis-à-vis develop a detailed perspective against other commercially available products and / or products under development. We also recommend Key Performance Indicators (KPI) and Key Success Factors (KSF) based on product benchmarking, competitive intensity, patient preferences and market positioning. Deal Tracking: We track partnerships / agreements inked across various industries / sectors, helping our clients implement their respective go-to-market strategies and other relevant initiatives through collaborations and / or acquisitions. We offer insights developed though detailed analyses, highlighting the types of agreement, relevant financial details and an assessment of the strategic fit to the clients’ core competencies to drive wider adoption . We also prioritize and recommend potential opportunities for future collaboration based on specific parameters, such as nature of the molecule, type of target and indications under investigation. We also offer suggestions on financial models to determine various possible deal structures that may offer the desired Net Present Value over a defined period of time. 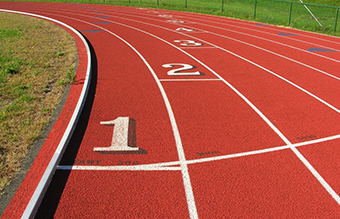 Competitive Profiling: We help our clients evaluate their competitors’ product / service portfolios, offering a one-stop solution for their competitor assessment and business profiling needs. We are aware of the importance of staying ahead of competition, especially when it comes to operating in niche / upcoming markets. Our competitive intelligence team is dedicated to developing detailed drug / device / technology / company profiles, which can be tailored to our clients’ decision-making needs, enabling them to improve and optimize their strategic objectives and define future roadmaps, based on the intent and outlook of their competitors. We have a well-established, proprietary approach that can be used to analyze and deliver highly comprehensive assessments of evolving market landscapes. The approach includes a mix of secondary research (sourcing data from company websites, industry databases, annual reports, investor presentations, industry analysts’ views and other information portals available in the public domain) and targeted primary research (soliciting the opinions of seasoned industry stakeholders and veteran executives). Commercial Strategy and Business Development: We engage in supporting our clients identify, filter and evaluate in-licensing / out-licensing opportunities to drive their commercial business development strategies and global expansion plans. We identify, screen, evaluate and engage with prospective licensing and development partners. We develop an understanding of the commercial potential of our clients’ products to drive focused sales / business development efforts. In addition to recommending potential licensing partners, we provide assistance in developing optimal deal structures with suitable partners, taking into consideration R&D / other costs, payback time, upfront / milestone and royalty payments, and facilitate discussions to help our clients grow and capitalize on these opportunities.